In November we showed you how a ruffle attachment works, tucking little pleats into the fabric just before the needle stitches them in place. So what’s the different between a gathering foot and a ruffle? Right away you’ll notice that the gathering foot it just one piece, whereas the ruffle has many different pieces working together to pleat the fabric, and adjustments for setting the depth and frequency of the tucks. A gathering foot, such as BERNINA Gathering Foot #16, doesn’t have moving parts. But look closely and you’ll see that the sole of this foot doesn’t rest evenly on the feed dog. This causes the fabric to feed unevenly, forming gathers as it passes under the foot and is stitched by the needle. The amount of gathering is adjusted by changing the stitch length and needle tension, and is also affected by the weight and stiffness of the fabric. You may have noticed that the sole of the gathering foot has two layers; this is for stitching ruffles directly to a flat piece of fabric. Place the fabric to be gathered under the foot as usual, face up, and place the flat piece face down on top, through the slot. The fabric against the feed dog gathers, and the fabric in the slot stays flat. This foot is especially good for making ruffles for garments and heirloom sewing projects. 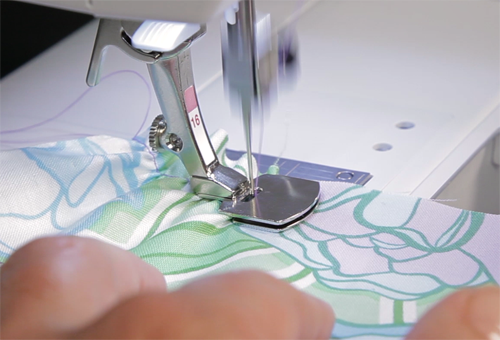 Previous Previous post: WeAllSew Celebrates Our Loyal Fans: 67,000 Likes!